The first generation of Seagate Barracuda ATA was a success thanks to the outstanding linear read speed. But as time went by, the drives were getting more ordinary, and the fifth generation - Seagate Barracuda ATA V - had nothing extraordinary. Either this fact or the marketing policy made the company change the line name and "skip" the sixth generation. So, now we have Seagate Barracuda 7200.7 line. Have a look at the specs of the new line in comparison with the older one. Some specs at the company's site are incorrect (ST380013A is specified having a 2MB buffer, which is wrong) and we have changed them according to what the company told us directly. The new line has a high recording density (80GB per platter) and a much lower average search time (by 0.5 ms). It should boost the performance markedly in all tests. Besides, the developers removed the SeaShield that was attached the the previous drives underneath. I'm not sure but I think it's done for better heat removal. The only confirming fact is that the temperature of Seagate Barracuda ATA IV with the SeaShield coincides with that of Seagate Barracuda 7200.7 without it (460C was fixed by the built-in sensor after three-hour operation of Intel IOMeter. The measurements were made with DTemp). OS - Windows 2000 Professional SP2. The test suite is standard as well. The read speed at the beginning even exceeds 60 millions bytes per second, and the diagram data are proved with HDTach - Read speed maximum 61316.0kps. The diagram itself looks perfect. 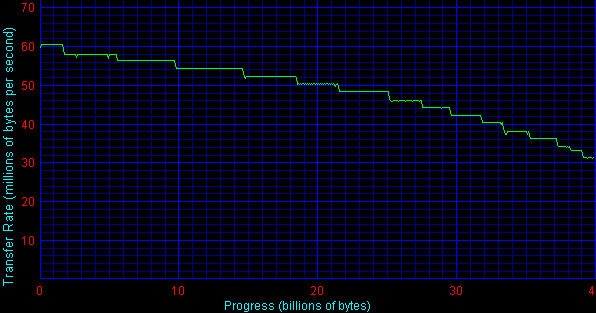 It's not clear why the write speed is not rising up. Instead of falling down the search time goes up by 1.5 ms!!! 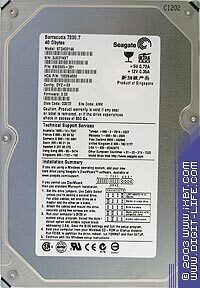 I understand that Seagate has its own technique of measuring this parameters, and it's impossible to calculate it by adding the specified latency and average search time (4.16 + 8.5 = 12.66 ms). But I do trust the test results. Average Response Time in Intel IOMeter (Random Read in case of line loading) also shows 15.4324 ms. Maybe, I got a faulty sample. But the company gave no response and didn't offer yet another sample to test. I will try to test another sample, but remember that this is not a preproduction drive, and you have every chance to get a drive with the same characteristics. Well, the following tests are not going to demonstrate anything good, but let's carry out them anyway. High-End WinMark scores rise marginally and Business WinMark results fall down. The increase linear read speed go along with the increase access time. And as I have already mentioned the new models lag behind in Business WinMark. Recording is terrible. I think that there are problems in the firmware version; well, let's wait for the company's comments. Now have a look at the summary results of the latest models of the leading companies to find out what market this model target. The read speed is excellent, in contrast to the write one. The access time is unexpectedly pretty good. If it were not for the expectations, it would be similar to the very first line which had superb read speed and rather big access time. High-End WinMarks look pretty good, though Business scores are not shining. Seagate's drive goes on a par with Maxtor's models and outpaces them at higher loads. Recording is very poor - the drive falls into the tail. The new Seagate's model reminds the first ATA Barracudas. Unfortunately, the expectations of the specs didn't come true. 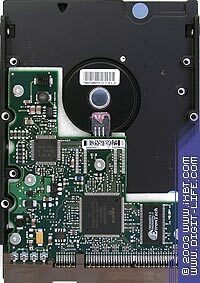 The new drive is not a leader but a good but mid-level drive with a high read speed and a low write one. Soon I will test a 80GB model and then make a final verdict.